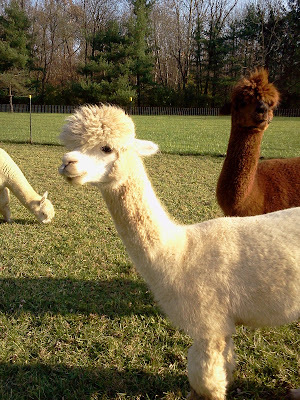 North River Alpacas will host an open farm day on Saturday, May 18th from 10am - 4pm. Come out and meet the alpacas! Check out Toby’s new Mohawk haircut and Alex’s bangs! They were all sheared in April and are sporting new hairdo’s! Farm day will include free admission. The farm store carries alpaca products, crafts and goodies. Kids are welcome. The alpacas LOVE visitors and carrots; they especially like visitors bringing carrots, what a combination! North River Alpacas is located at 2800 North River Road in Clifton. (3rd house on the left off of SR72. Call 937-767-2343 for more information.